The clinical cause for Constricted Toe Syndrome is poorly understood. Histopathology revealed fibrous bands of connective tissue literally impinging on the blood supply around the lesion. The causes in young birds specifically could be inadequate humidity in the brooder humidity as well as genetic predisposition. In older birds, nutritional deficiencies, bacterial infections or hypersensitivity reactions and fungal toxins could be suspected. Popular treatments include massage (to increase blood circulation in this area, warm water baths, magnesium sulfate soaks and topical Dimethyl sulfoxide (DMSO). Some vets prescribe antibiotics routinely, however, given the myriad causes that could be involved that doesn't seem to be prudent and could be counterproductive. Other vets perform surgical treatments to rectify this condition. 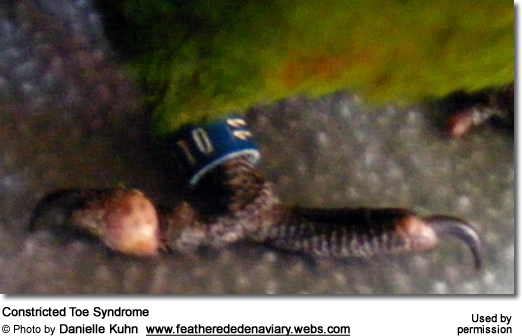 In some instances, amputation is necessary, if the toe has been deemed lost or is posing a threat to the bird's health or comfort.